You are in charge of your body, and there are things that you can do to help alleviate your symptoms. 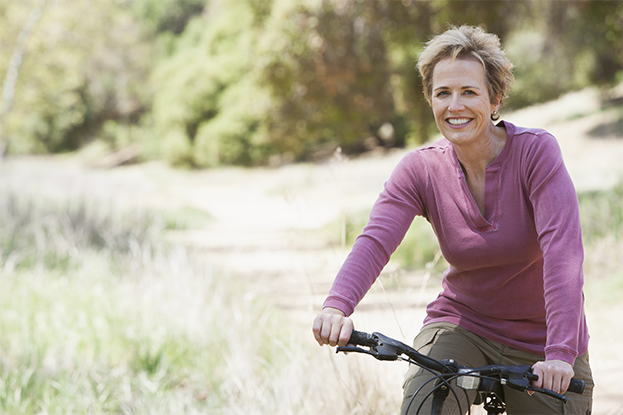 A healthy lifestyle can help to reduce the effects of the menopause, whilst keeping the heart and bones strong. Make the menopause a good time to review your lifestyle. Keep your diet low in saturated fat and salt to reduce blood pressure, and rich in calcium and vitamin D to strengthen bones. Eat plenty of fresh fruit and vegetables. Some women take dietary supplements to help get the balance right. Some women also found cutting out tea and coffee can help with hot flushes. Regular exercise helps to reduce stress, keeps you feeling positive, whilst guarding against heart disease. A regular, varied programme is best: try cycling, swimming, running or aerobics. Wear loose layers of light cotton or silk clothes so you can easily take some clothes off if you overheat. Have layers of sheets on the bed rather than a duvet so you can remove them as you need to and keep the bedroom cool. Smoking has been shown to lead to an earlier menopause and trigger hot flushes. If you smoke you also run a higher risk of developing osteoporosis and heart disease. The combination of excessive alcohol and hormonal instability is a risky one! Alcohol increases flushes and is associated with an increased risk of breast cancer. Try not to drink more than 1 to 2 units of alcohol per day, and avoid drinking larges amounts in one occasion. Are alternatives to HRT, which may be useful for women with pre-existing or a family history of certain medical conditions for whom HRT is not recommended. You can get many different treatments for menopausal symptoms without a prescription. If you wish to try these, do talk to your healthcare professional because their quality and ingredients may be unknown. It's better to be safe than sorry!